Our 15 passenger van meets campers at central locations for the ride to and from camp. Our goal is to accommodate as many families as possible and to make the trip to Westtown easier. The cost for the van is $85 per week per child, or $140 per week for a family. Call the office for an approximate van schedule at 845-361-2267. All camp van drivers receive a background check and safety review. We provide booster seats for campers under age 7. 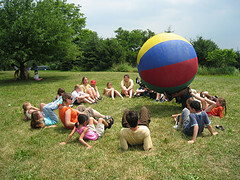 For more information and estimated pickup and dropoff schedule call Kate at (845) 361-CAMP. or e-mail us.